meaning is created through a concentrated focus on body gestures and the sounds made in between articulated words. The framework of the piece comes from rational speech, but the work transforms into something visceral, which we understand only through our instinct. We respond to a piece of music with a similar natural intuition. I want to create a kind of abstract ‘music’ by transforming logical sounds and images. During the live ‘GROUP’ I asked participants to try to focus on listening, rather than thinking about their own voice. In the same method of concentration, this video work will focus the eyes and the ears towards tiny details; mishaps in speech, subtle hand gestures, wandering eyes. These mannerisms are what make us human and connect us to one another, in a greater way than the literary contents of our speech, or the character we aim to project. minds to uphold how they stumble! over and submits to the past. occasional obstruction, natural obstructions that make the voice human. silent admissions of new, calm air, unspoiled and unashamed. 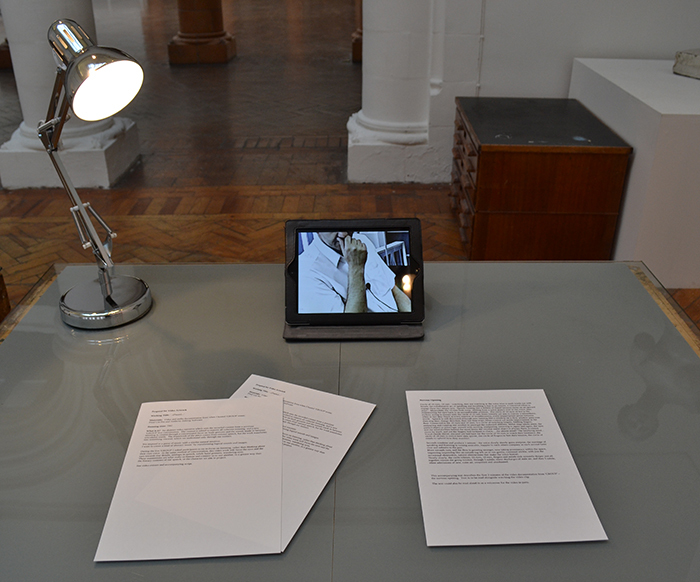 This accompanying text describes the first 2 minutes of the video documentation from ‘GROUP’: the nervous opening. Text is to be read alongside watching the video clip.